Cyclist Of Greater St. Louis (COGS). St. Louis Bicycle Touring Society (SLBTS). It is with great sadness and sorrow that the Anderson Family of Saint Louis MO informs you that "Intense Blue", a TREK 830 Mountain bike has passed away on April 29th, 2003. Intense Blue was 14 years old and has lived a long and rewarding life. He was born in 1988 in Waterloo Wisconsin and moved to Saint Louis MO 1989. Intense Blue lived and recreated with the Anderson Family for 14 years and rode nearly 14,000 miles in his career. Highlights of his life include: the 1994 week long Tour of Door County Wisconsin (201 miles), the 1995 week long Biking Across Kansas (575 miles), the 2001 week long The Other Great Iowa Ride (437 miles). Intense Blue was very fond of children and often accommodated them on rides along with his owner. Over the past nine years of his life Intense Blue carried children over 3,300 miles. Intense Blue is survived by his twin sister "Pearl White", also a 1988 TREK 830 mountain bike and by his owner, Robert P. Anderson of Webster Groves MO. Intense Blue's frame will be shipped back to the TREK factory in Waterloo WI where he will, literally, meet his maker. Visitation of the remains (handlebars, seat, fork, pedals etc.) will take place on Sunday 05/04/2003. It will be an open box. Donations may be sent to the "Buy Rob a New Ride" Fund setup to honor the memory of Intense Blue and to get Rob pedaling again. 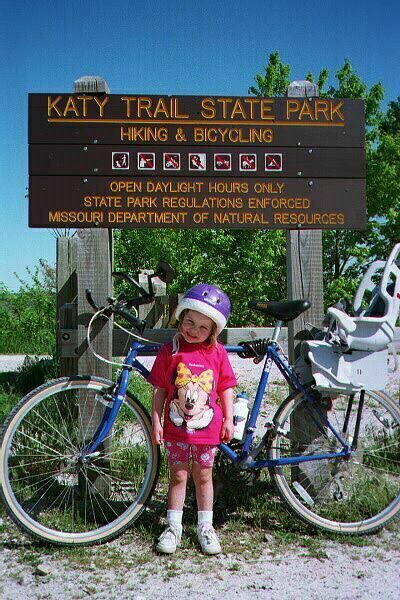 Picture taken in 1999 somewhere between Defiance and Dutzow MO on the KATY Trail. TREK 830 bicycle is modeled by Miss Katie Anderson. Katie always wears her helmet when on the bike.